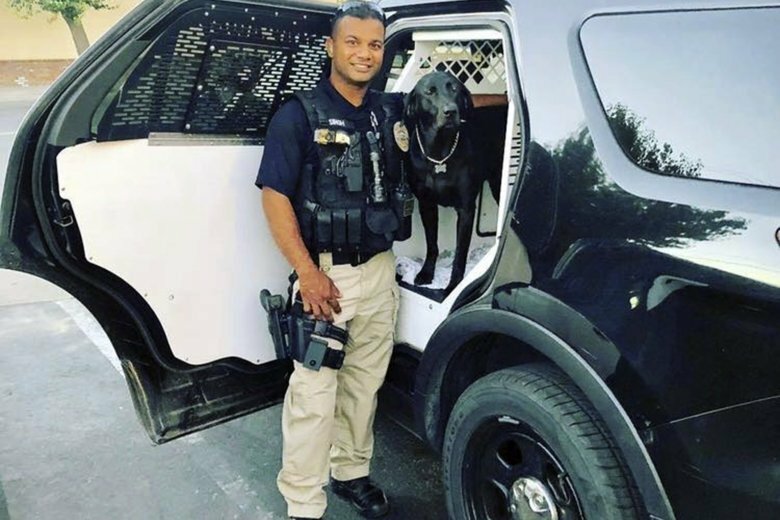 NEWMAN, Calif. (AP) — The flag-draped casket of a California police officer who authorities say was shot to death by a man in the country illegally was carried in a procession Friday through the streets he once patrolled to a public viewing in a community theater. The killing of Cpl. Ronil Singh has rekindled a debate over California’s sanctuary law that limits cooperation by local authorities with federal immigration authorities. On Thursday, Trump called Singh’s family to offer his condolences, the White House said. People waving American flags lined up along the streets of the Central Valley town of Newman, where a viewing was held for Singh, who was shot Dec. 26 during a traffic stop. Prosecutors on Wednesday charged 33-year-old Gustavo Perez Arriaga with murder. He was arrested after a dayslong manhunt as he prepared to flee to Mexico, authorities said. The casket was driven in a procession from Modesto into a theater in Newman where the marquee read “Ronil Singh Forever Remember” while several officers saluted. The casket was taken from the hearse into the theater for a viewing as the police department’s 12 officers and Singh’s family followed. A memorial service and burial is scheduled Saturday in Modesto. Singh, 33, who emigrated from his native Fiji to pursue a career in law enforcement, joined the Newman police force in 2011. He was married and had a 5-month-old son. Prosecutors said Perez Arriaga shot Singh after the officer stopped his vehicle to see if he was driving drunk. He has two previous drunken driving arrests, authorities said. At his first court appearance, Perez Arriaga told the judge that his real name is Paulo Virgen Mendoza, but authorities were still referring to him as Perez Arriaga in court documents. His attorney, Stephen Foley, questioned his client’s mental competency, leading the court to delay the case until a mental health evaluation is done.